Eleven rare Siberian tigers have died over the last three months at a zoo in north-eastern China. The local authorities believe that a lack of food contributed to their deaths, according to media reports. The news is bound to raise concerns about the treatment of captive tigers in China, which is this year celebrating the year of the tiger. China has only about 50 tigers left in the wild, but it has about 5,000 in captivity. 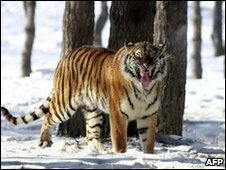 The tigers died at the Shenyang Forest Wild Animal Zoo in Liaoning Province. That fact was confirmed by a worker at the zoo. But there are discrepancies about how they died. A local wildlife protection official, Liu Xiaoqiang, is reported to have said that malnutrition was one cause. The tigers were apparently fed cheap chicken bones. Mr Liu also said that the tigers had been kept in very small cages, restricting their movement and lowering their resistance to disease. A manager at the zoo, which is currently closed, said the animals simply died of various diseases. But however the tigers died, their deaths will inevitably raise questions about how the animals are treated in China. Animal campaign groups say there is simply not enough protection for tigers held in the country's zoos and farms. A spokesman for the International Fund for Animal Welfare in Beijing said: "[The government has] given too many credentials to groups that do not have the capability of taking care of these animals." In China there is also still a trade in tiger parts, which are used in traditional Chinese medicine. They are used to treat rheumatism and to strengthen bones. The BBC recently found that the Siberia Tiger Park, based in Heilongjiang Province in the northeast of China, is selling a "tiger bone wine" that contains three small tiger bones. These issues have been discussed for some time, both inside and outside China, but they are being given extra prominence this year - because this year is the year of the tiger.